FORMER governor of Anambra State, Dr. Chukwuemeke Ezeife, has said that it is either Nigeria is restructured into six geopolitical zones or it goes into referendum to decide if the country will remain as one country or disintegrate. Ezeife also said the Southern Peoples Assembly, SPA, will soon meet to take a decision on whether the people of southern Nigeria will participate in 2019 elections if the country was not restructured. He went further to pre-empt that it is possible the people of southern part of Nigeria will boycott the election if President Muhammadu Buhari’s administration does not restructure the country immediately. In fact, Ezeife gave Buhari’s government an ultimatum to immediately convene an urgent national summit, which its agenda, he suggested, would be to adopt a framework for the inevitable restructuring. 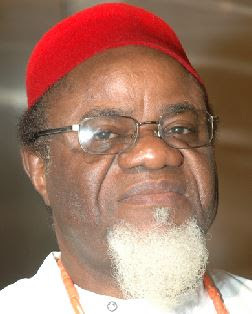 Ezeife made the statement, yesterday, when he chaired the First Chinua Achebe International Conference organised by the Institute of African Studies, University of Nigeria, Nsukka. At the conference, the Obi of Onitsha, HRM Igwe Alfred Achebe, said the late prolific author, Chinua Achebe, would always be remembered by Ndigbo for projecting the Igbo world view, the history, culture and cosmology. Igbo, first settlers in Ile-Ife—Igwe Achebe Achebe said the Igbo society existed beyond what Achebe recorded in his books, disclosing that a recent history book has ascribed to the Igbo as the original settlers in Ile-Ife and whom Oduduwa met, other than the present contest between the Ife and the Ugbo sections in Yoruba land. Director of Institute of African Studies, Prof. Emeka Nwabueze, said the conference was a celebration to honour the sage, Chinua Achebe. Nwabueze said the institute decided to host the first Achebe conference since Achebe was a member of the university community. He disclosed that all institutes of African Studies in the world will converge in UNN by November this year to draw a blueprint on how best to teach African studies. Other persons who spoke at the conference included the former Governor of Imo state, Chief Ikedi Ohakim; former Minister of State for Foreign Affairs, Mrs. Viola Onwuleri; veteran actor, Pete Edochie, among others.